Philadelphia Tenants Union organizers make their voices heard at the Law & Governance committee meeting, photo by Maddie Rose. “This is THE event to show [up] to in the fight against gentrification,” according to the facebook event page urging Philadelphians to attend the Good Cause Bill Hearing before the city’s Law & Governance Committee. They go on to explain that “Good Cause is a bill that would prevent landlords from evicting tenants without a good reason…in other words, good tenants should stay in their homes.” The organizers, Philadelphia Tenants’ Union (PTU) and Philadelphia for a Good Cause, probably slept a little easier last night as Good Cause passed committee and moves on to city council. The victory marks a decisive win in a protracted battle against gentrification. 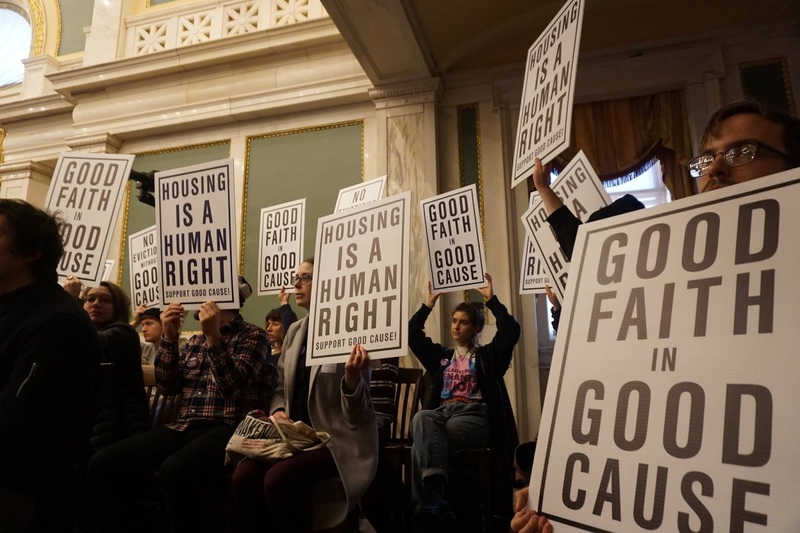 The campaign for Good Cause legislation has been one of the rallying cries of the Philadelphia Tenants’ Union, who see the deck as unevenly stacked against tenants, especially more vulnerable tenants such as mothers, Black families, the disabled, the elderly, and others. With eviction rates in some communities over 15% in recent years, and rates of evictions in majority Black communities three times higher than others, it’s hard not to sympathize with the notion. Philadelphia Tenants Union celebrates the victory, photo by Maddie Rose. The hearing was the culmination of at least two years of canvassing for thousands of signatures, tenant organizing, and advocacy spearheaded by the PTU to increase protections for tenants. The fight broke through the apathy of City Council when 230 tenants of Penn Wynn were summarily evicted to make room for a ritzy, pool-bedecked apartment complex for nearby university students. The tenants, with the help of the PTU, managed to directly confront the new landlords who evicted them — and in the process, confront City Council — demanding “No eviction without ‘good cause.’” City Councilman Curtis Jones, who represents the district Penn Wynn is in, introduced the legislation. And while the bill may have notable limitations (Councilman Jones commented at the meeting that he was not for rent control: “…I don’t want to be New York…”), this campaign represents the victory of a direct struggle. It shows the capacity of folks willing to organize where they work and, in this case, where they live to build power and confidence. This ultimately represents a bigger win than any one piece of legislation, it represents the power of an organized community to define its neighborhood.